For Adele Morse, every animal has a personality. 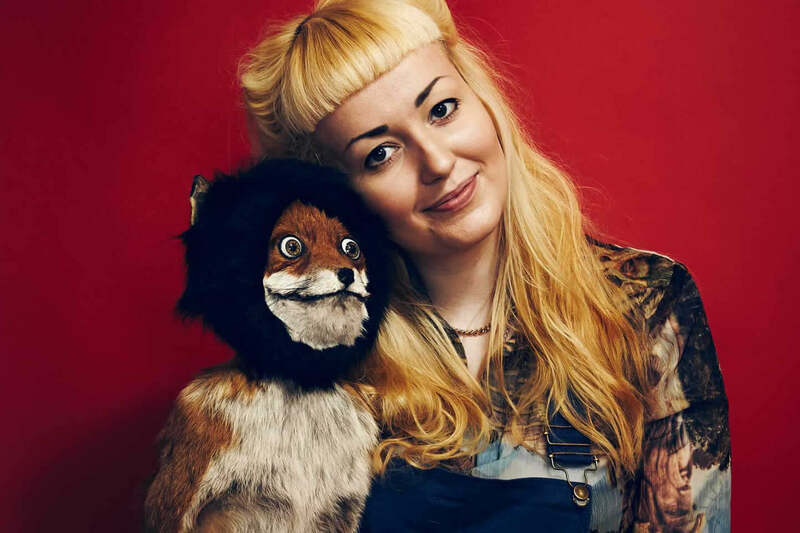 A Welsh artist based in London, this belief has fuelled her unique take on taxidermy, with every piece determined to preserve an animal's character as much as their fur. The recipe for Morse's success has been an odd combination of failure, Reddit and the Russian internet. Graduating from the Royal Academy's MFA Fine Art programme in 2012, Morse's most famous work - stoned fox, began life as a failed Masters project. 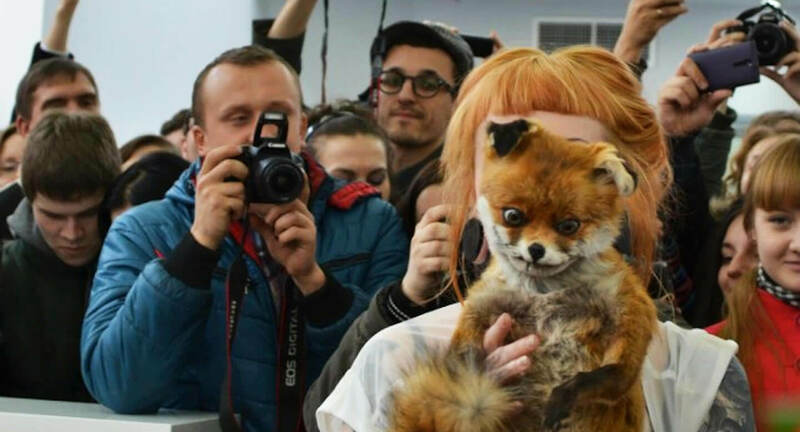 Intended to resemble a human boy in a Halloween fox costume, the fox was too badly damaged and despite a period of frustrating trial and error, ended up looking dejected. Chalking it down as a noble failure, Morse stuck the fox on eBay, sold it to Mike Boorman, a music producer from Manchester and thought nothing of it. 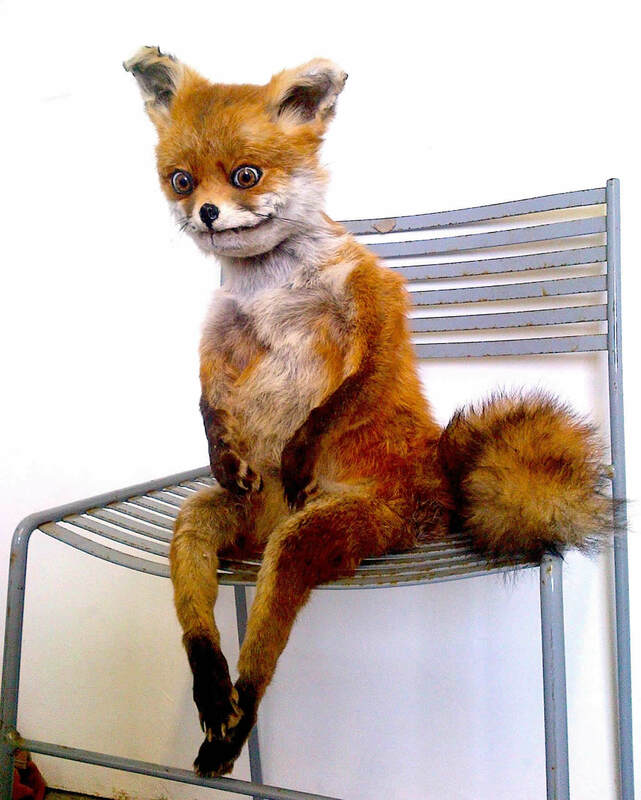 Little did Adele know that the fox's downbeat, vacant stare and defeated body posture would become perfect visual shorthand for internet memes. Despite worldwide usage, it was in Russia where Morse's fox found its audience. Starting off as funny meme on Russian message boards, almost a symbol of political dissent in Russia, the Russian edition of the Metro eventually declaring it 'The Winner of the Internet' in 2012. Morse was invited to Russia to tour with her piece, and while it was not without controversy, with boycotts in St Petersburg and the Communist Party branding the piece 'Russophobic' and 'vile' - it did catapult Morse into a unique position in the art world. Not that Morse see her work as 'art', on her website she is keen to stress that the aim of her work is always to "ensure the animal's character is the focus and not just a material in an artwork". This deep respect for her subject matter means that her work always has an endearing, almost charming quality. This, along with her new-found notoriety, means that Adele has recently moved into a bigger studio in East London, where she now produces and sells work to people all over the globe. 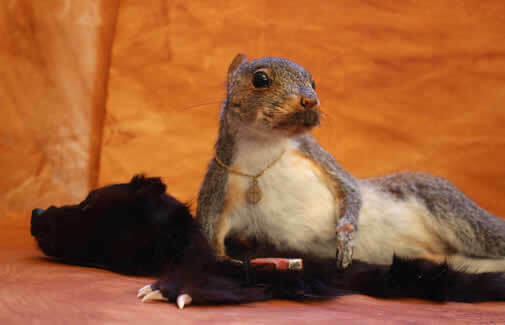 How did you get started in taxidermy? When I was a kid I used to go to Cardiff museum all the time and I loved the taxidermy section, I loved seeing all these animals up close and seeing so many variations within the species. 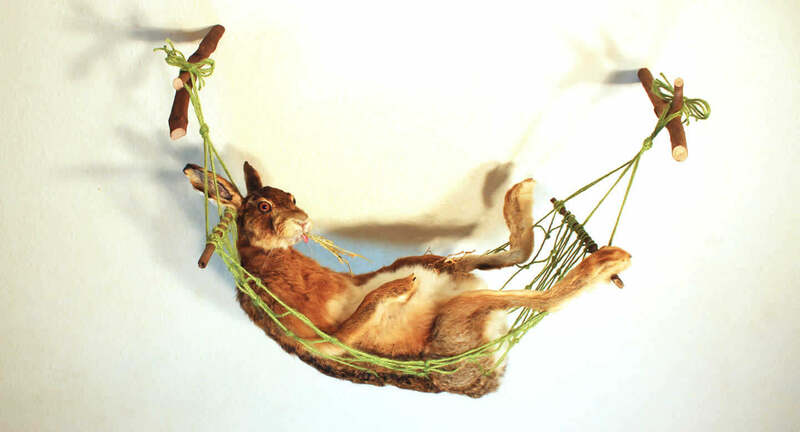 When I was around 14 I spoke to a taxidermist at a nature family day and I kind of got hooked on the idea of doing it myself. I researched for a few years and then when I was 18 I bought a dead mouse from a pet shop and followed this old book. When I started, taxidermy was a bit of an old boy's club, with only a couple of women making work, but it's become much more mainstream in recent years. The upside is my work is so tailored to the customer a lot of the time you know it will be in that family for generations. The animals I have preserved get to do amazing things and live in nice houses with all kinds of people and that makes me happy and sometimes a little bit jealous! 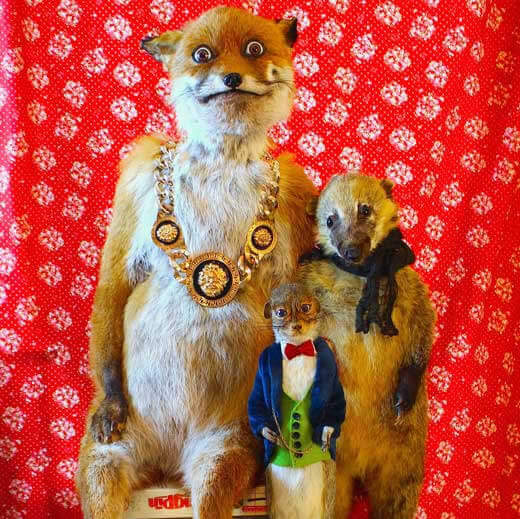 My biggest inspiration is Walter Potter, one of the great anthropomorphic taxidermists. I loved the interaction between the animals in his tableaux and I want to modernise that idea. 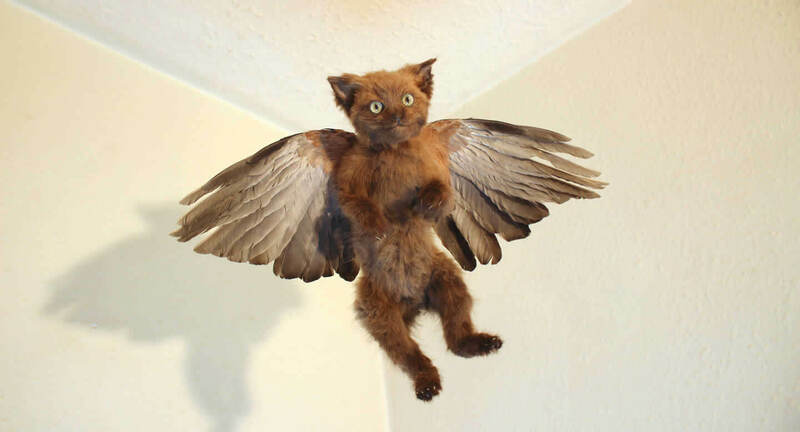 I want to keep to the definition of taxidermy which is "to place the skin" but to change the form inside. I absorb a lot of popular culture; art, films, comics. I get inspiration from the most highbrow to the trashiest of place, from being in the jungle to watching the real housewives; I take little snippets from everything. Ultimately, the best way to get inspired is by studying animals themselves in nature shows or in the wild. Capturing their personality is the most important part for me; there is a lightbulb moment where an animal just zings back to life. Is it true that you're vegetarian? How does that effect your work? Yeah, I've been vegetarian for 15 years now. For me it's perfectly normal - but it does surprise a lot of people. For me it's a personal decision, I've had so many bonds with animals over the years I would find it strange to eat them. When you see the inner workings of animals on a daily basis it's not very appetising. I am not vocal about it usually and I have friends who own farms and hunt, I think it's important to let people live how they want to and let them have their own opinions and boundaries. "I've been vegetarian for 15 years, for me it's perfectly normal - but it does surprise a lot of people." How do you go about sourcing and storing your materials? The animals I use can come from anywhere; farmers, friends, donations, natural deaths, road casualties, sometimes pest controllers, pet shops, other taxidermists, groundskeepers. Social media has massively improved the ease of getting something as there is a network of people who keep freezers full of roadkill. Other materials I get from all over the place. 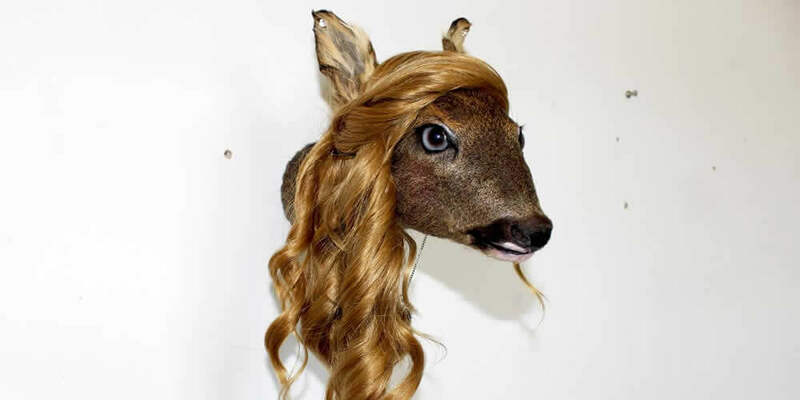 I am always looking for new ways to do things and improve my technique so I try and constantly research online and talk to other taxidermists to keep improving my materials and methods. What's the most important item you own? How is it vital to your work? I would say my camera. 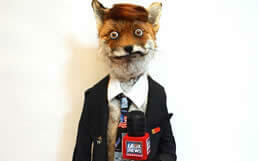 Until 4 years ago, I didn't document any of my work properly and when the photo of my fox went viral and people wanted him to be featured in books and newspapers I only had this photo taken on my Blackberry. It's embarrassing and frustrating that the first image that comes up with my name is this low-quality photo. I got the camera in exchange for doing a live appearance in a Russian version of Argos! As soon as I figured out how to change the language from Russian to English my work has been well documented and it's made a huge difference. Also, my freezers are invaluable. I always get funny looks from work men when they see my lists written on the freezers and a near panic attack when a friend goes to look for ice without consulting me first. How did you go about setting up a workshop? I wanted to be able to live alone, so I gave up the studio that I was sharing with some of my former classmates at the Royal Academy. Having former classmates was good for getting feedback on my work but the expense was too much on top of my rent. 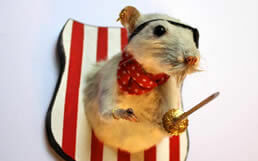 So, I made the decision to scale back on the large sculptures I was making and concentrate on taxidermy. I do most of the work on a table in the room I also sleep in which isn't ideal but I wanted to invest as much money as I could back into my equipment and taxidermy work. It's quite difficult to make a nice house inside a studio and the struggle between having a studio in my flat and sleeping in a studio is never ending but I feel sincerely lucky to be able to do what I love doing full time. I am up late most nights fiddling with something, making a wig for a fox or learning to weave a hammock and it's nice to be able to do this from home. It's a labour of love and it's not very glamourous but nothing worth doing is easy for the first few years. What's more important in a workspace - for it to be inspirational or functional? As space is so tight I'm constantly trying to make my studio more functional. I have a fold away dining table that fits against a wall and a lot of shelving and storage. I work in all mediums and on anything from taxidermy, clay work, resin, sculpture, film, and I have a shop which I hand make all the things for so I must have storage for a lot of boxes and packing materials as well as the stock. I do a lot of woodwork and electrics so I am forever scavenging wood. I am a self-confessed hoarder as almost everything genuinely does come in handy. Some old wig is the perfect texture for a fox toupee or an old necklace will have the parts for a miniature camera for a rabbit private detective. I'm constantly making and doing DIY or electrical work. I was always that kid that took everything apart and wanted tools for Christmas and not a lot has changed. I've found some great things over the years; one of the best things is these miniature red shopping baskets I found on the street in hackney. They are great for storage and it's like playing shop when I fill one with what I need before I start a project. How do you best make use of your space? I have a lot of multipurpose furniture. I designed and built a storage shelf for my printer with legs that double as cat scratching posts, my TV stand has compartments where I keep all my shop supplies. My bedside table is also where I do all my filing of invoices and receipts. Is there one piece of equipment that would make your life easier? This sounds horrible but aside from another freezer, I could really do with a fleshing machine. It's kind of like a grinding tool that just makes removing all the sinews off the skin a lot easier and a lot faster. This is the worst part of the job and this machine makes it nice and easy. They are difficult to get in the UK and they are heavy and expensive and I am always trying to work out how to make one but avoid getting electrocuted!